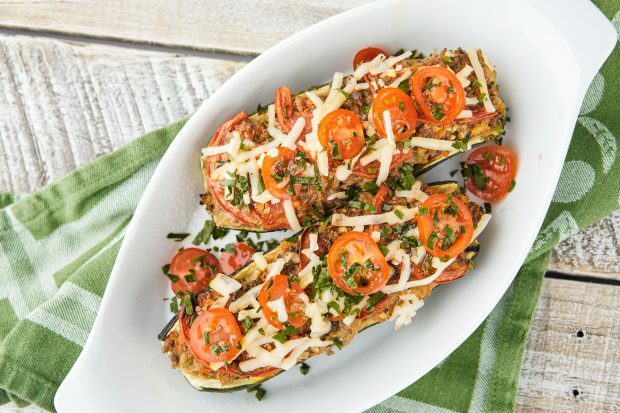 Zucchini boats are very filling and super delicious. I love using zucchinis in my recipes as they are 96% water based, great source of fiber and low in net carbs. When paired with lean protein, they make a balanced meal that will keep you full and satisfied for hours. 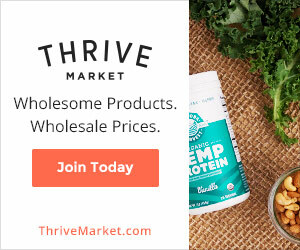 In this recipe, I use enough beef to fill each half so you can easily have half a zucchini, pair it with a green salad and a side of broccoli mash. STEP 1. Preheat oven to 400 F or 200 C.
STEP 2. Slice the zucchini in half longways and scoop out the zucchini meat using a small spoon. 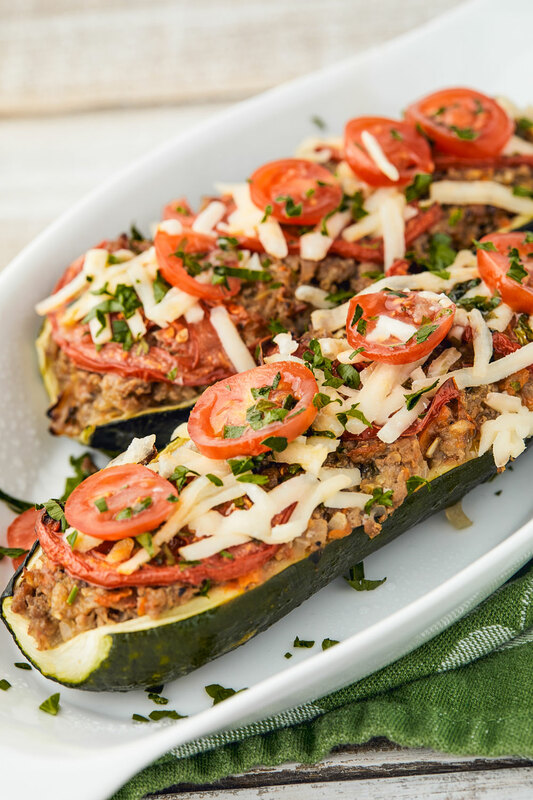 Chop the zucchini meat into small squares. STEP 3. Heat olive oil in a large skillet and add the onion, carrot, zucchini meat and cook for 2 minutes. Add the garlic and sauté for 30 seconds. Add the beef, turmeric, cumin and cook for about 5 minutes, until brown. Use a wooden spoon or a potato masher to break up the meat so it doesn’t have any chunks. STEP 4. Add the grated tomato and simmer for 5 minutes. STEP 5. 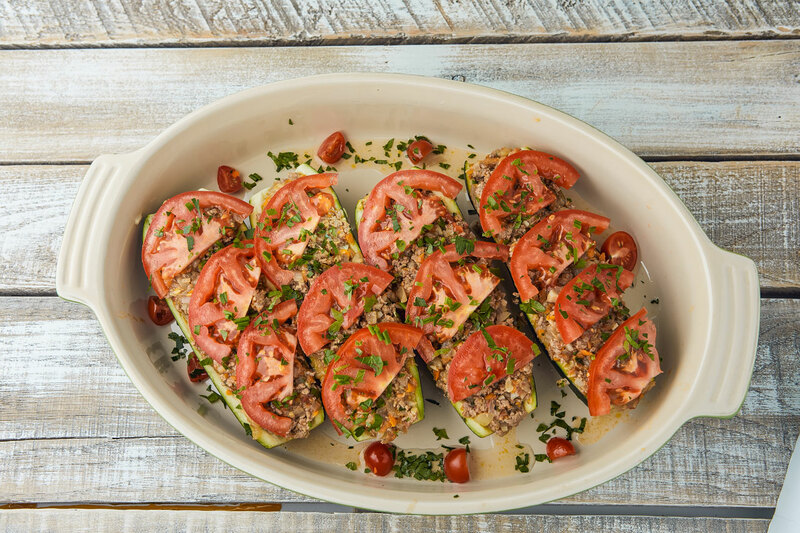 In a baking dish, add the zucchini boats and fill them with the meat mixture. Add 1/2 cup of water to the baking dish and bake on 400 F for 20 minutes, until golden.